South America is a continent situated in the Western Hemisphere, mostly in the Southern Hemisphere, with a relatively small portion in the Northern Hemisphere. The continent is also considered a subcontinent of the Americas. It is bordered on the west by the Pacific Ocean and on the north and east by the Atlantic Ocean; North America and the Caribbean Sea lie to the northwest. South America ranks fourth in area after Asia, Africa, and North America and fifth in population after Asia, Africa, Europe, and North America. The Giza Necropolis is an archaeological site on the Giza Plateau which is on the outer border of Cairo, Egypt. The major ancient monuments at this site include a complex of the three pyramids known as the Great Pyramids and the gigantic statue known as the Great Sphinx. 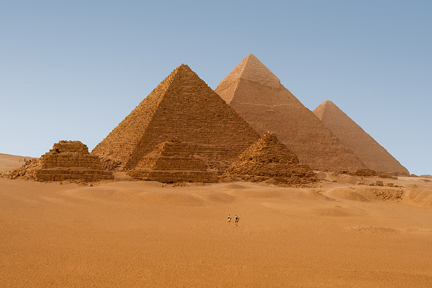 Today there are about 100 or more pyramids in Egypt; the most famous ones are those at Giza. It is the oldest and largest of the three pyramids at Giza. It is also the oldest of the Seven Wonders of the Ancient World, and the only one to remain largely intact. Egyptologists think that the pyramid was built as a tomb for fourth dynasty Egyptian Pharaoh Khufu (Cheops in Greek) over about 20 year period concluding around 2560 BC. The Great Pyramid was the tallest man-made structure in the world for over 3,800 years. When it was built, the pyramid measured nearly 480 feet high with the sides each measuring about 755 feet long. In addition, each side is oriented with one of the cardinal points (north, south, east and west). 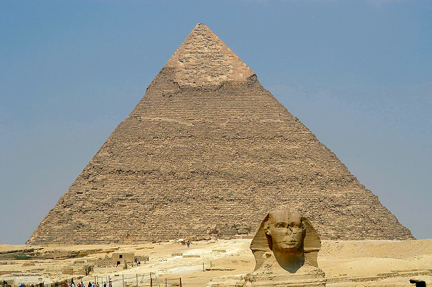 Nearly 2.3 million blocks of limestone, each weighing 2 tons or more were used in constructing the pyramid. Inside the Great Pyramid, there are three burial chambers and is known to contain both ascending and descending passages. The lowest chamber is underground and was cut into the bedrock upon which the pyramid was built and was unfinished. The Queen's Chamber and King's Chamber are higher up within the pyramid structure. The Great Pyramid was the center focus of a highly structured complex. It included several small pyramids, boat pits, a mortuary temple, a causeway, a valley temple, and many tombs for nobles and the royal family. Among the Pyramids at Giza, the Great Pyramid of Giza (the Pyramid of Khufu or Cheops) being the largest, the rather smaller sized Pyramid of Khafre (or Chephren) is a few hundred meters to the south-west. The Pyramid of Menkaure (or Mykerinos) is relatively modest-sized, a few hundred meters further south-west. The Great Sphinx is on the east side of the complex of Pyramids at Giza. It is the second-largest of the Ancient Egyptian Pyramids of Giza and the tomb of the fourth-dynasty pharaoh Khafre (Chephren). It sits southwest of the Great Pyramid on the Giza Plateau. The pyramid has rises to a height of about 448 feet. The Pyramid is made of limestone blocks. Khafre's Pyramid appears larger than the nearby Khufu’s Pyramid because of its more elevated location as it sits on bedrock higher than Khufu’s pyramid and the steeper angle of inclination of its construction. It is smaller in both height and volume than Khufu’s pyramid. Inside Khafre’s pyramid, there are chambers with ascending and descending passageways. Khafre’s pyramid complex includes a valley temple, a causeway, a mortuary temple, and the king’s pyramid. It is located on the Giza Plateau in the southwestern outer edge of Cairo and is the smallest of the three Pyramids of Giza. It sits southwest of the Second Pyramid on the Giza Plateau. It was built to serve as the tomb of the fourth dynasty Egyptian Pharaoh Menkaure. Its original height was about 218 feet. It now stands at 204 feet tall. It was constructed with blocks of limestone and granite. The Great Sphinx of Giza is a statue of a reclining sphinx (a mythical creature with a lion's body, a human head, paws, and a tail) that is situated on the Giza Plateau on the west bank of the river Nile in Giza, Egypt. The statue of the Sphinx is carved out of the surrounding limestone bedrock, it stands approximately 240 feet long, 20 feet wide, and 66 feet high, making it one of the largest monolith statues in the world. It is believed to have been built by ancient Egyptians of the Old Kingdom during the reign of the pharaoh Khafra. Copyright © 2012 - www.Travel-Ancient-World-Sites.com - All Rights Reserved.